According to their website the word Tattu is a corruption of Tattoo and Tatau, an ancient eastern word meaning ‘to make a mark’. The first thing which makes a mark is the decor. 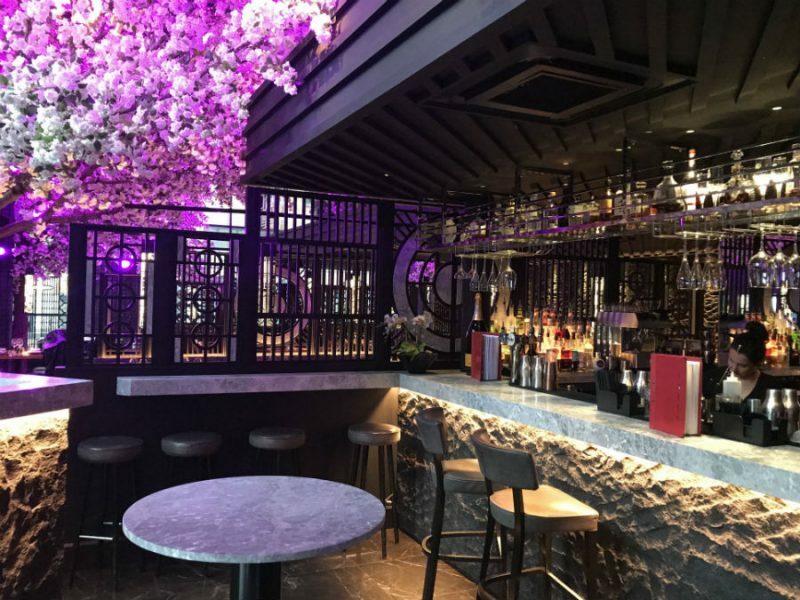 On entering the restaurant, customers are met with one of a series of huge faux cherry trees in full bloom seeming to span the whole of the room. My coat was taken by the manageress who met me at the door. She gave me a choice of table, which is always a nice touch for lone diners who need a bit of passing interest as we don’t get lost in meaningful conversation. As I was sitting down I was asked if I would like some edamame beans and when I replied in the affirmative I was offered salty or spiced. I opted for the latter. I spurned the cocktail and wine lists as I had seen a couple of beer pumps on the bar, so settled for a half of Asahi and a glass of tap water. This week I fancied going somewhere a little special. I had heard about Tattu and so I thought that I would give it a try. I unpacked my trusty iPad, accessed the Telegraph crossword and settled down to be pampered. The beer and water arrived in short order so I started tapping away at the screen. This was an activity which had to cease when the edamame beans arrived. They were fresh, warm and still in their pods, which was great except that the spicy sauce had been poured over the top meaning that I spent some time podding them and getting my fingers covered in the bright red sauce in the process. I don’t know what the purpose of doing this was as it couldn’t permeate the double layer of pod and skin in which this particular bean is encased, so the only way to taste the sauce is by either licking the outside of the pod, or your fingers should you decide to liberate the beans first. I employed a mixture of the two, the waiter having brought me a second napkin to wipe my hands, although a finger bowl may have been a good idea as I needed to wash my hands before the starter arrived. I needn’t have bothered because I had ordered Crispy Pork Belly to begin the meal. 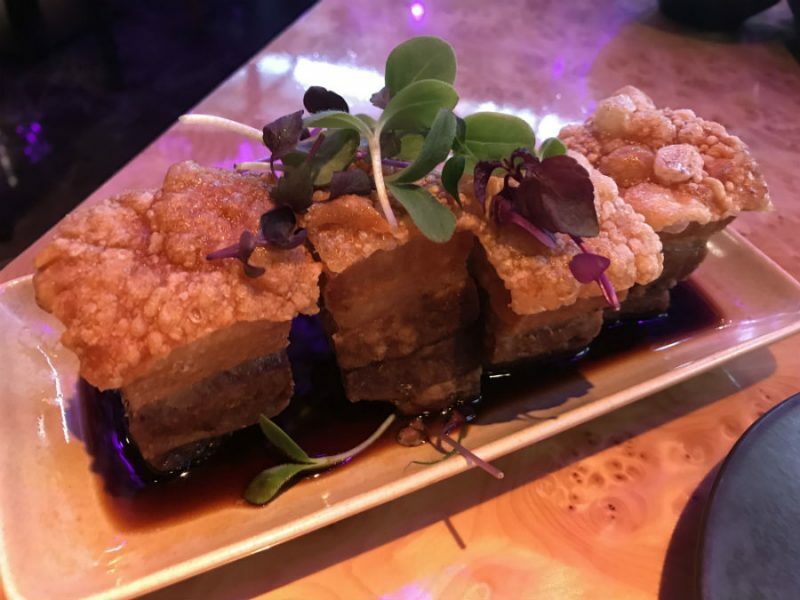 The pork belly looked spectacular and was delivered in four square-based pieces thicker than I have ever been served before. The reason that my hand wash was unnecessary was that they were impossible to pick up using chopsticks so my fingers were employed again. I am sure that I could have eaten them in the traditional Chinese manner had they not been overdone. It seemed as though the belly had been cut into segments before being heated, or probably re-heated, meaning that they were fairly solid rather than tender and unctuous. They were very tasty and the crackling on top was light and crispy but the overcooking let the dish down. I held each piece by the crackling part and ate them from the bottom up. Once I had bitten into the meat part the inside was just right so why they didn’t cook the meat in one piece and then cut it into four is beyond me. When the starter was delivered to the table I had informed the waiter that I was in no hurry and to give me a break between this and the main course. The interval enabled me to tackle the remaining edamame pods and mess up the second napkin even more. After just the right amount of time the waiter asked if I was ready for the main dish of Crispy Shredded Chilli Beef and I said that I was. When I had ordered this I was asked if I would like steamed rice or vegetables. I chose the former and a couple of minutes later the ensemble arrived along with a second half of beer. The beef came on a bed of tomato, chilli and garlic along with onions and dried chillis, which I was advised by the waiter to approach with caution as they were very potent. As someone who will do whatever I am told not to, I took a small bite from one of the dried chillis and became so grateful that I had ordered the water. I am no wimp when it comes to hot food but this was off the scale so, discretion being the better part of valour, I decided to leave them at the side of the plate. I once again had a suspicion that the dish had been cooked some time earlier and re-heated as the beef was nothing like crispy and was, once again, simply an overcooked dish. Its flavour was a bit sweet and sourish, the dried peppers being the only thing to separate it from the run of the mill version. I am sorry to be so critical but this is not a cheap place to eat and, after reading the ‘Our Story’ section of their website, I would have expected something a little more inspired. The front of house staff were impeccably mannered and very pleasant, although the same could not be said for those working in the kitchen from which came the sound of a continuous argument raging the whole time I was there. I had visions of the oriental versions of Gordon Ramsey and Marco Pierre White having an ‘artistic difference’ regarding some ingredient or another. I may not have been too wide of the mark as, when I asked the waiter what the kerfuffle was about he said that they were developing a new menu. I think that they should get the current one right before moving on. 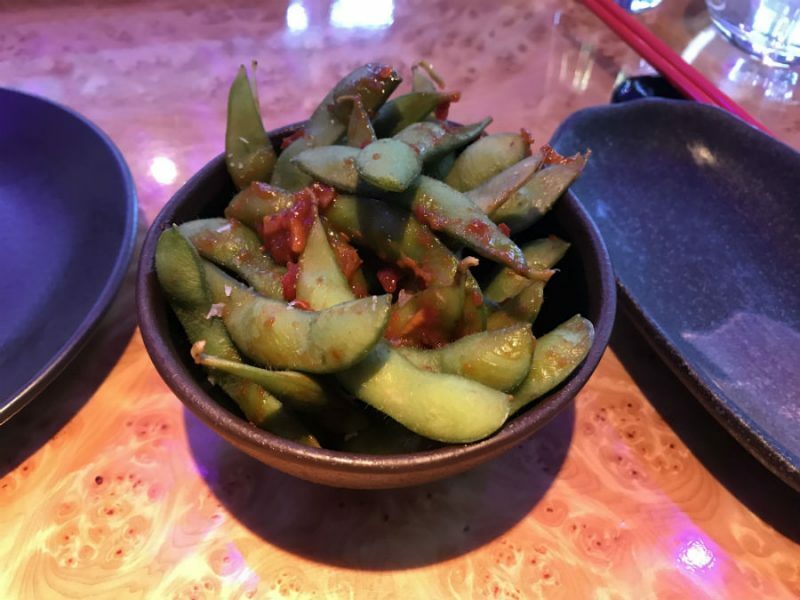 The expense was increased not only by the two halves of lager and the edamame beans, which I suspected were not included, but the steamed rice also came as an extra. This meant that, with the discretional 10% service charge added, the bill for the £22.50 two-course lunch option came to £35.20. Three courses would have cost an extra five pounds. There is also a Dim Sum Lunch available with two dishes being £13, three dishes £18 and four £22. I prefer to share dim sum which is why I went for the more conventional option. 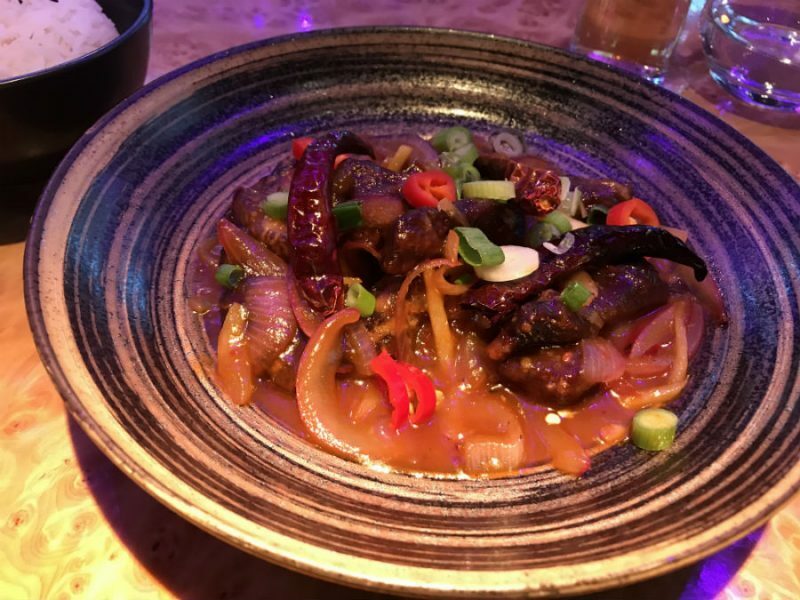 I must say that I was disappointed with the food mainly because it was so nearly right but not of the quality for this price range, although the rest of the experience was very pleasant. Sadly the tatau for me was of the wrong kind.